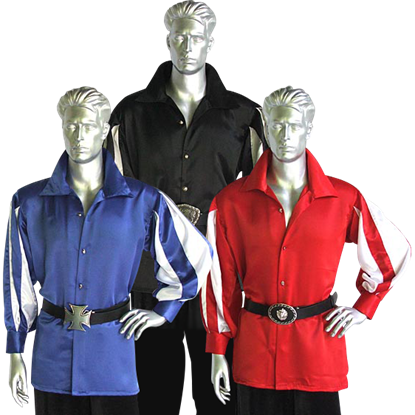 With the right shirt, you can achieve a multitude of historic looks. 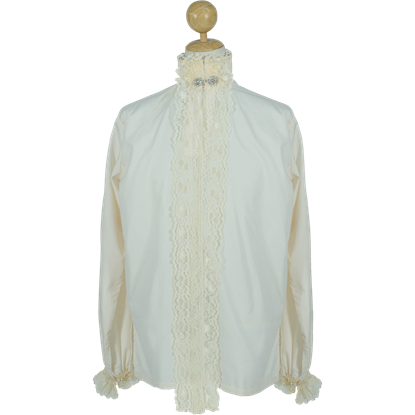 Your Dressmaker offers you a fantastic selection of historic shirts that are expertly handcrafted in authentic styles out of high quality materials. 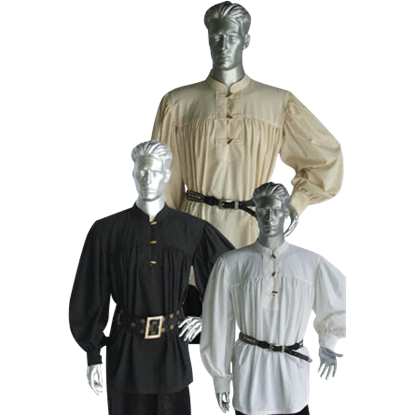 Woven natural cotton makes up most of our peasant shirts, pirate shirts, medieval knight shirts, and other essential shirts that will suit almost any character. 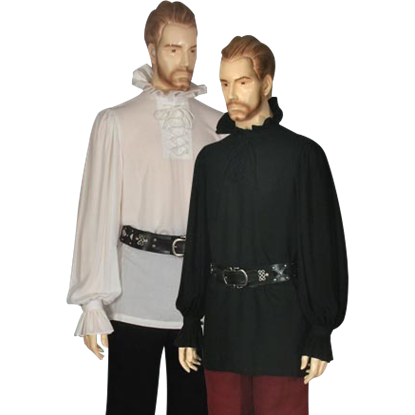 Some of our Renaissance shirts are well-suited to nobility and are made out of high quality satin. 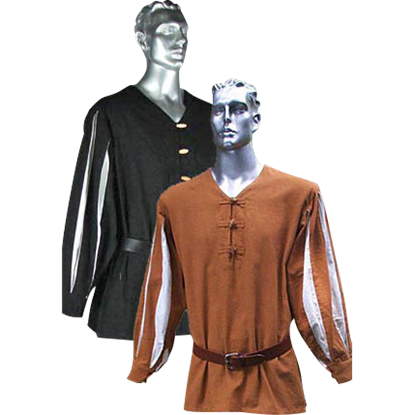 The perfect start to any outfit, our mens medieval shirts can serve as a base for almost any historic look, whether you prefer to dress as a squire, Crusader, bandit, swordsman, or even a well-to-do Renaissance lord. 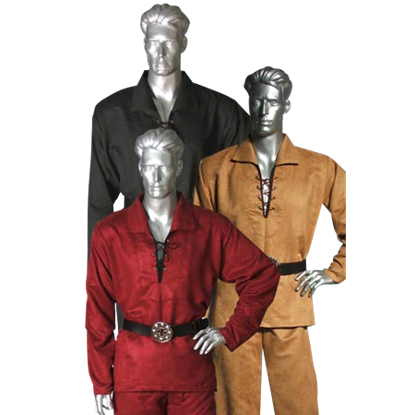 Choose from high collar shirts, lace up shirts, loose fitting shirts intended to be accentuated with a belt, shirts with billowing sleeves, and more. 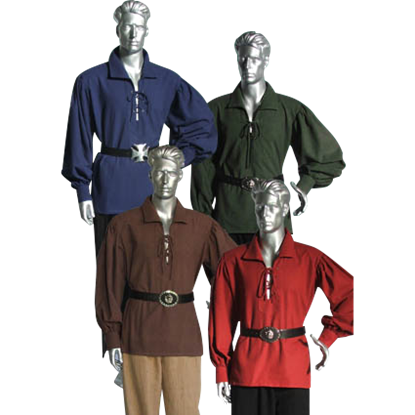 Many of our mens period shirts make versatile bases for almost any look, from the lowliest serf to a noble knight and beyond. Our shirts can also be specially tailored to fit your size and come in a variety of colors ranging from essential neutrals to the bright colors of medieval heraldry. Wear them to your next Renaissance festival, historic reenactment, or LARP event for a look that will help you fit right into your chosen setting and time period. 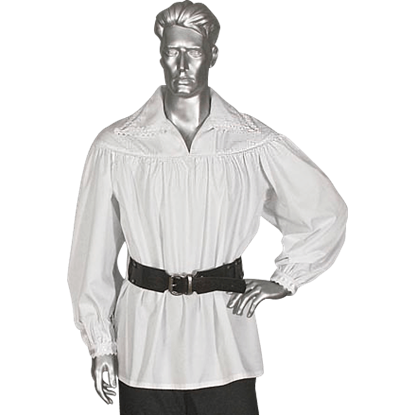 It is not difficult to see why the Basic Pirate Shirt is so popular a design. This loose-fitting shirt is made from natural cotton and fits quite comfortably, while still offering the wide range of movement key to any pirates success. 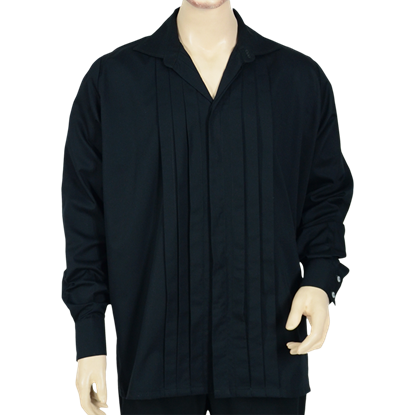 Made out of soft, lightweight, and comfortable suede textured fabric, the Buccaneer Suede Shirt is a sure staple in any reenactors wardrobe. Stylish and versatile, this authentic inspired shirt is great for a number of historic looks. 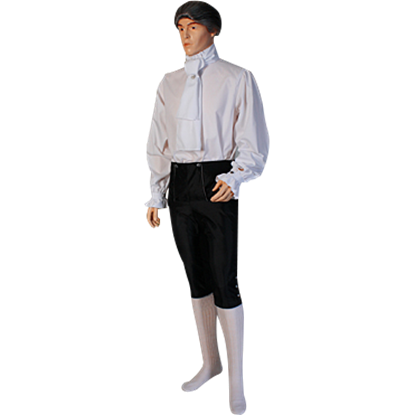 The French Baron Shirt is a decorative shirt that could be considered a staple of renaissance style. Made from quality batiste fabric, this shirt is an elegant garment that no self-respecting renaissance noble would be seen without. 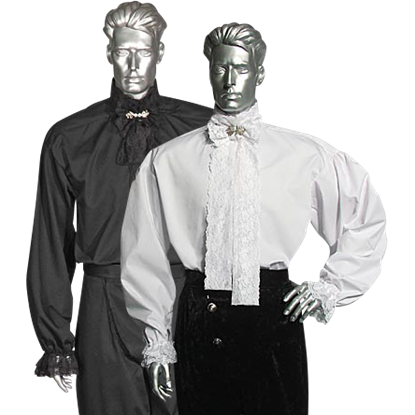 Nothing exemplifies baroque style better than this High Collared Victorian Shirt. This shirt is handmade from batiste fabric and features a touch of esoteric style that elevates this shirt from fancy yet forgettable to eye-catching. 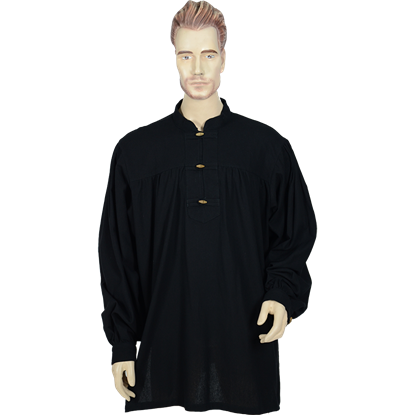 Made of high-quality satin, the Knights Slashed Sleeve Shirt is the ideal shirt for a knight to wear when spending a day in the noble courts. 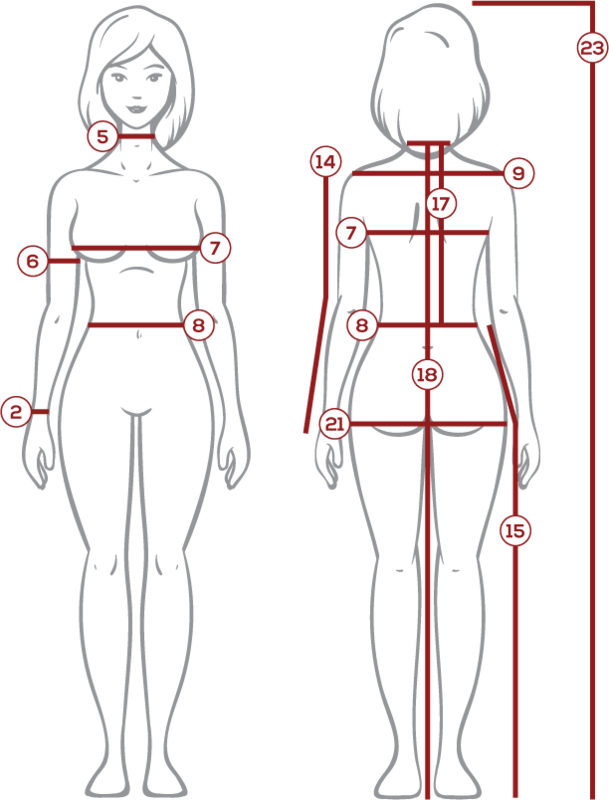 This elegant yet simple garment is stylishly decorated and yet supremely comfortable. In many ways, being a musketeer is harder than being a typical warrior or soldier. Not only must a musketeer be valiant and skilled, but he must also be well-dressed. In the Musketeer Shirt, you are well on your way to being just that. The average, everyday medieval person did not need fancy clothing. They needed something that was functional. They needed a garment like the Peasant Shirt, which features effective, simple construction without any frivolous decoration.